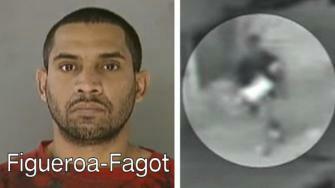 Carlos Figueroa-Fagot has been arrested in Philadelphia for the attempted kidnapping of a 10-year-old girl. The girl was able to escape the abduction attempt by biting the Fagot. The Fagot has been in custody since this morning. According to Action News, the Fagot has been charged with attempted kidnapping, unlawful restraint, indecent assault, aggravated indecent assault, corrupting the morals of a minor, inteference with the custody of a child, simple assault, false imprisonment and unlawful contact with a minor. The child’s mother of whom only a Hearts and Tribal wrist tattoo could be seen on the news credits the videotape Stranger Danger with giving her child the foresight to escape from this Fagot’s grabby hands. ~ by chrismcdevitt on July 19, 2012.